Arlene Holmes says she did not suspect he had a severe mental illness. "He was the most responsible person I knew, my own son. He managed his finances, looked after himself completely. Wen't to school every single day without complaint. Did all his chores without being told. You'd tell him once what to do and he did it." "I still love my son, yes." "Because I understand he has a serious mental illness. he didn't ask for that. Schizophrenia chose him. He didn't choose it." @Clancy I was thinking the exact same thing. Reboot, just in time. Thank Phil for the heads up! @Della-wow!! I missed that!?! I thought she did the regular "...do you support your son, love your son, still continue to care for him to this day.." -the entire "drill" she does with every witness...so she did not do that with the dad!?! That's a glaring omission-- I did not notice!!! 'Shocked. Did others catch this as well...? Blonde may be doing this. @me. you are so very correct!! RH did say he loved his son. Brady asked him if loved his son. He said yes. She asked "why". He said "because he's my son and we have a good relationship"
To me, hearing those words from his parents would be much more salient & moving than from a 3rd grade teacher, etc. This guy had a thousand chances. Well it didn't "go without saying" when she asked the sister that. It added extra emotion to her testimony. It makes the testimony end strong for the defense that's why I'm saying I noticed she didn't ask RH because you'd think Brady would want a strong finish like with the sister. @Della -- Brady did ask him that. Good Afternoon, everyone.....not sure I am emotionally ready for Arlene, ugh. As a mother, my heart hurts for her. However, each victim had a mother too. This will be difficult to hear. I feel so badly for all of the victim of this crime - the parents of Holmes included. I feel so bad for his mother. How do you get such a close shot? I prefer Higgs questioning his mom. As a mother, this is heartbreaking. 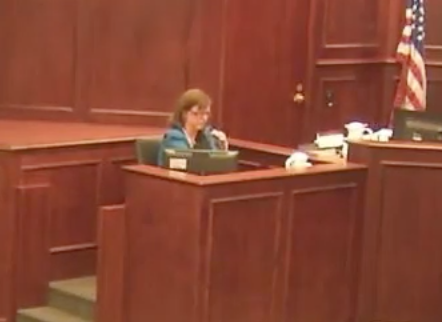 "If you're asking me about the time in Colorado... it (his conversations) got shorter and shorter"
"I didn't realize that his loudest cry for help was his silence"
Do you wish she had (expressed to you that he had homicidal ideations)? "Of course I do... We wouldn't be here if she had told me that"
"She didn't. She didn't. She didn't tell me"
"She didn't say that she thought he might be psychotic"
Arlene Holmes says "I was reassured by her phone call, that he was coming for help. But at the end of the month he wouldn't be a student anymore and his student insurance wouldn't cover it." "We called him as soon as my husband got home"
"we called him and left a voicemail and he didn't call. So we emailed"